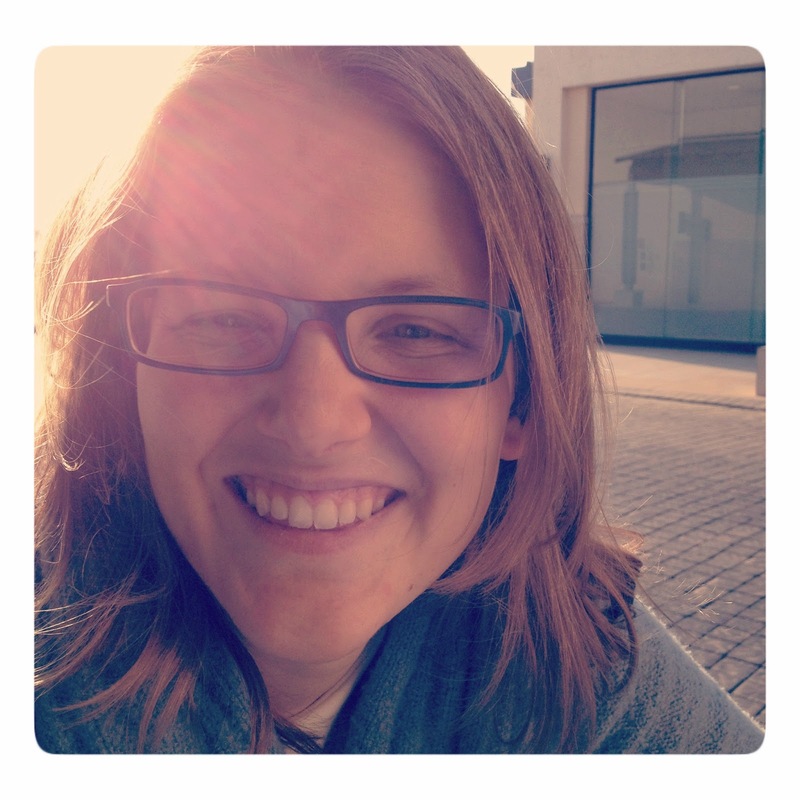 In January 2013, my husband and I had a plan for the year. In February, we discovered my husband’s cancer wasn’t in remission and all our plans for the year didn’t matter much anymore. In their place were hospital visits and chemotherapy and a stem cell transplant. In the middle of all our plans going awry I realised that even when my life seems out of control, God knew the plan the whole time. I’m pretty sure Joseph wondered that quite a few times too. The Bible tells us in Genesis that as a child Joseph was his father's favourite son. The problem was he had ten older brothers who hated him for this and decided to kill him. At the last minute, one of his brothers saw an opportunity to save Josephs’ life and instead, the brothers sold Joseph into a life of slavery. As a slave, Joseph was unfairly accused of sexually harassing his master's wife and sent to jail. Right about now, I’m thinking God “allowed” a lot of horrible stuff to happen to him. Then, things started turning around for Joseph. Pharoah began having dreams he didn’t understand, and he heard that there was man in prison who could unravel the meaning of dreams. So he got Joseph out the dungeon, gave him a bath and a shave, and asked him to interpret his dreams. After telling Pharoah that the country was going to have seven years of good crops and then seven years of drought and famine, Joseph was put in charge of all the crops in Egypt. The Bible says Joseph stored up so much grain it was like the sands of the sea. When the famine came, Joseph not only fed all of Egypt but also ended up saving the lives of his brothers, who had thrown him into slavery. I find this comforting because an awful lot of bad stuff happened to Joseph but God turned it around. Despite the questions and the uncertainty and the pain, I do find it heartening that whatever happens, God – who loves me – has the last word. 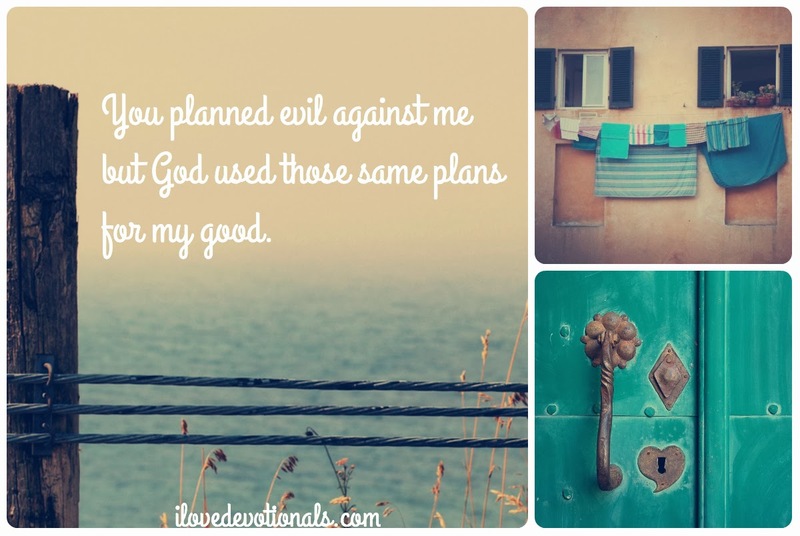 I’m sure if I could see the beginning from the end, I’d see that God’s last word is always better than my best laid plans. 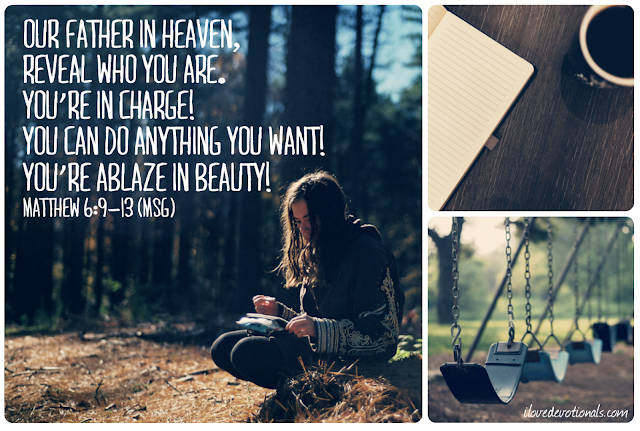 Ponder: What plans are you making for 2014? If your year turns out differently to the way you are planning how do you think it will change how you believe God is in control of your life? 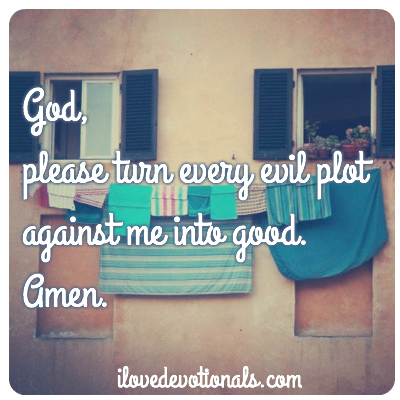 Pray: God, please turn every evil plot against me into good. Amen.